Wallace Benn is speaker at Derby Bible Week 2013. 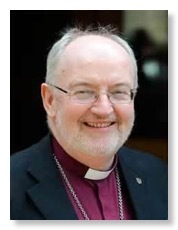 Wallace Benn has recently retired as Bishop of Lewes. As well as having spent 25 years in parish ministry, he is a well known, and inspirational, teacher and speaker. He is also a published author, having written articles for various theological journals. He is particularly keen to see the Word of God honoured and believed. Wallace is President of the Church of England Evangelical Council and Chairman of Bible by the Beach, an annual Bible teaching conference in Eastbourne. He lives with his wife Lindsay in East Sussex and they have a married daughter and a son who works as a Graphic Designer in London. He is an enthusiastic rugby watcher and supporter, and enjoys motor racing. Can I get a copy of the flyer? Click here to get a PDF of the flyer. Monday 15th to Thursday 18th April 2013 at Woodlands Evangelical Church from 7.30 p.m. each evening.